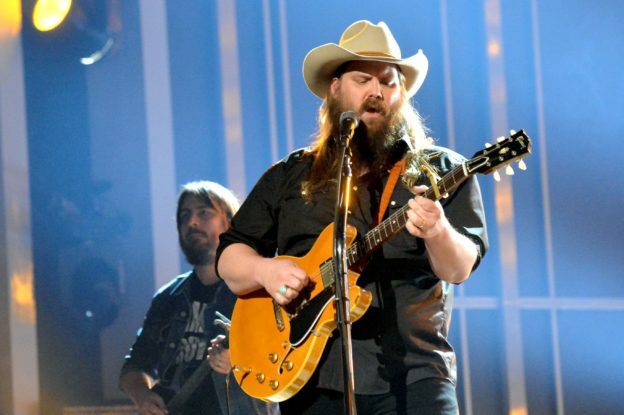 Chris Stapleton’s ‘Broken Halos’ Finally Reaches Number One! The Number One. It is the way you know you’ve arrived, it’s the benchmark for which other’s judge your success in music. Over the years, the elusive Number One spot has been so close, Stapleton could almost taste it. In April 2016, ‘Nobody To Blame’ reached Number 10 on the Billboard Country Airplay chart. Then in February 2017, ‘Parachute’ reached Number 17 and three months later in May of 2017, ‘Either Way’ reached Number 26. Despite being one of the biggest names in country music, and winning so many coveted awards and accolades, Chris Stapleton never had any of his songs hit Number One. That is until now! It’s been a long time coming, but in late March ‘Broken Halos’ finally reached the Number One spot on Billboard’s Country Airplay chart. Stapleton’s debut album, ‘Traveler,’ was released in 2015 and was certified double Platinum by the RIAA. In July of 2017, Stapleton released his nine-track sophomore album titled ‘From a Room: Volume 1.’ It was awarded the 2017 CMA Album of the Year and 2018 Grammy Country Album of the Year. Just a few weeks ago, at the ACM Awards, Chris Stapleton brought home Album of the Year and Male Vocalist of the Year. He was unable to attend the awards ceremony, as his wife Morgane had just given birth to precious twin boys, on his birthday no less! Back in November, at the CMA awards, he earned Album of the Year and Male Vocalist of the Year as well. At this show, Stapleton had the opportunity to perform ‘Broken Halos,’ for a packed audience. It was an unforgettable moment on stage which included his wife and producer David Cobb. He told Wide Open Country: “In light of the tragic kind of year we’ve had, that was the only song we could play.” The crowd just ate up the entire performance. The first track, ‘Broken Halos,’ also won a 2018 Grammy Award for Best Country Song. In an interview with Country Fancast, Stapleton said: “This is a song about people who have passed away before their time. I recorded this on a day where a friend of mine passed away from pancreatic cancer. He was the same age as me. We played little league together and all that. He was 38.” We can all relate to the meaning behind this song. Perhaps this is why it has become such a fan favorite. It is clear that Stapleton made the right decision when he left The SteelDrivers and presented the country music community with a song like ‘Broken Halos.’ He has certainly accomplished a lot with his new number one. We can’t wait to see what the future holds for Chris Stapleton! The best news is that you can see Stapleton in New England this summer! He’ll be at the Xfinity Center in Mansfield, MA on Saturday June 30th. He’ll also be at the Bank of New Hampshire Pavilion in Gilford, NH on Friday August 24th and Saturday August 25th. You can purchase ‘Broken Halos’ on ‘From a Room: Volume 1’ on iTunes here. This entry was posted in Home page blog and tagged Broken Halos, Chris Stapleton, CMA, Grammy Awards, Mike Henderson on April 26, 2018 by BeckyNECM.